Lincoln Financial Field, affectionately known to locals as “The Linc,” seats almost 70,000 spectators — which means the stadium must provide parking facilities on a massive scale. The Linc is home field for the Philadelphia Eagles and the Temple University Owls. It is also the site of a variety of special events, ranging from concerts to the annual Army-Navy game. Finding “idle time” to have the parking lots sealcoated can be a challenge. 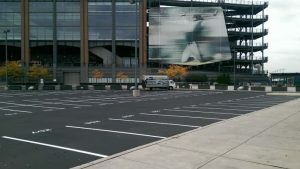 Recently, Asphalt Pavement Solutions was contracted to repair and sealcoat two parking lots at The Linc. The job involved filling 6,000 linear feet of cracks, sealcoating 135,000 square feet of pavement and marking 370 stalls. Furthermore, timing was crucial — there were only a few days during which the work could be performed before the lots had to be opened to traffic. According to John Verzi, owner of Asphalt Pavement Solutions, the short window of opportunity and the weather combined to add a bit of a challenge. “It was on the chilly side, and some days had high winds.” Due to both the scope of the job and the less-than-favorable weather, the job was estimated to take six or seven days from start to finish. The highly trained team members at APS, however, rose to the challenge and delivered a quality job in only four days. The Linc was back in business, the parking lots look great and their “health” has been protected against whatever the Philly weather decides to attack them with. Providing superior work — on time and within budget — is nothing new for the professionals at Asphalt Pavement Solutions. They have been doing just that for more than 30 years. APS provides a full range of asphalt services, including sealcoating, parking lot striping, asphalt repair and paving. Customers throughout Pennsylvania, Delaware and New Jersey rely on APS for all of their parking lot needs, from traffic signs to car stops. If you would like a free quote, you can use our online form to send us your information. If you prefer to call, our toll-free number is 1-800-559-SEAL, or you can reach us at (856) 544-3990 or (856) 461-1710. We look forward to discussing your next project with you.